Recorded 5-6 July 1926, Kingsway Hall, London. CR540 uses the alternate (A) cutting of the 1st take. The legendary trio of Cortot, Thibaud and Casals is woefully under-represented in the recording catalogue. Each a major artist in his own right, the trio came together for a month each year to tour between 1907 and 1934 (when split due to political differences). And yet they only recorded seven pieces, between 1926 and 1929 - two Trios by Beethoven, and one a piece by Haydn, Mendelssohn, Schubert and Schumann, together with Brahms' Double Concerto with Cortot at the baton. 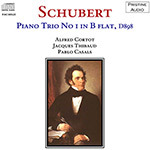 Of these recordings, the Schubert was the first, recorded in July 1926. This session ran so well and so smoothly that the trio, who'd always concentrated on the perfection of a relatively limited repertoire, was able to record Beethoven's Kakadu Variations and the same time. Despite the age of the recording and the use of very early electric recording technology - microphones were introduced into the recording process commercially in 1925 - this remains an amazingly powerful and valuable record of one of the great trios of all time. Every exquisite nuance of playing, phrasing and timing is preserved for the listener's enjoyment, and what residual surface noise remains is quickly forgotten in this magical performance.